AutoClerk Partners with Artificial Intelligence Company Akia to Re-invent the Hotel Guest Experience - AutoClerk, Inc.
WALNUT CREEK, CA – AutoClerk, Inc., a leading property management system (PMS) provider, has announced that it has partnered with Akia, a technology company that leverages artificial intelligence (AI) to power conversations between hotel staff and their guests. The system, created by a team of former Facebook engineers, is more than an automated response program. It can create work orders for housekeeping and maintenance, order valet service, or call for a bellman, employing AI so that it learns when and how to best initiate responses to guests, and saving hotel staff valuable time and resources. AutoClerk, Inc. has been building mission-critical software for the hospitality industry for three decades. Its two core products are Property Management Systems (PMS) — acPMS, which is a robust, premise-based system, and myHMS, which is a pure-cloud PMS that can run on any device with an internet connection and browser. Headquartered in California’s San Francisco Bay Area, AutoClerk provides 24/7, U.S.-based customer support, and is staffed entirely with professionals who have extensive experience in the hospitality industry. Still independently owned and operated, AutoClerk is a trusted partner in the hospitality industry and is endorsed by a variety of hotel franchisers, including Best Western Hotels & Resorts and RLH Corporation. AutoClerk was recently named as the official provider of PMS to the Asian American Hotel Owners Association (AAHOA), which serves more than 18,000 members. For more information, visit www.autoclerk.com. The Akia Syndicate is an artificial intelligence company whose mission is to put an AI-powered assistant in the pocket of every modern traveler. 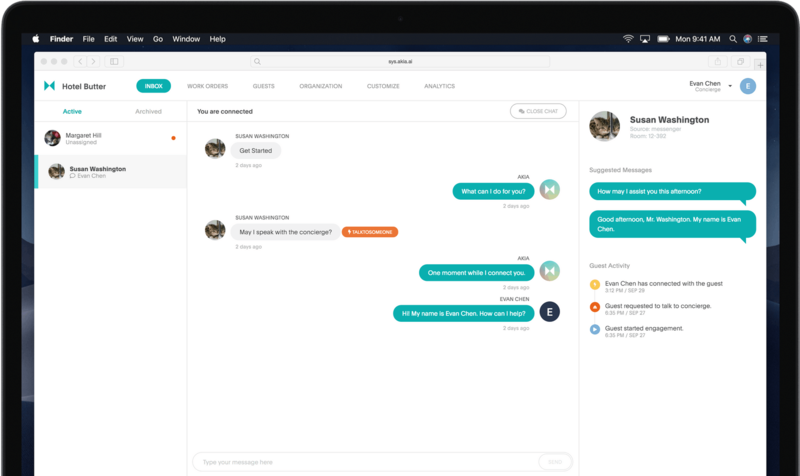 Its core product is a cross-device messaging system that reimagines communications for hotels by allowing their guests to connect to their staff, concierge, or Akia herself with a simple text. For more information, visit https://akia.ai.